In spite of local population opposition and years of pharaonic works, the deviation of the Sao Francisco River is about to be completed by the end of 2016. Sao Francisco is one of the major rivers of Brazil. Its basin is about 640.000 km2 and hosts a huge variety of climates, ecosystems as well as population. A project of deviation of its waters has been discussed in the country since mid of 19th century, to provide water to the arid Northeast region of Brazil. The project was detained for shortages in technologies and capabilities for such a major undertaking. It was then relaunched by President Getúlio Vargas and, later, Fernando Cardoso. A final proposal was approved in 2005 by Lula government, with an initial budget of 2 billion dollars. The plan was to divert massive quantities of water (1.4% of the river natural flow) from the main river to the northeastern regions of Ceara, Río Grande do Norte, Paraiba y Pernambuco, to take water to cities, irrigation facilities and industries. Lula government contracted the companies Ecology and Environment do Brasil, Agrar Consultoria and Estudos Técnicos e JP Meio Ambiente to carry out the Environmental Impact Study to be submitted to IBAMA. This was presented in 2004, and the project was finally given the current name "Projeto de Integração do Rio São Francisco com as Bacias Hidrográficas do Nordeste Setentrional". Finally the project was approved with the resolution 47/2005 (17/1) by the Conselho Nacional de Recursos Hídricos (CNRH). Works started in 2009 and are scheduled to finish by 2025. Costs rose to more than 8 billion Reais, more than the double of the original cost estimation, provided by the Programa de Aceleração ao Crescimento (PAC I e II). Strong opposition came from people living along the river, including Bishop Luis Cappio who went into a hunger strike. In 2011, the Plataforma Dhesca Brasil published an impacts assessment report, the "Relatório da Missão à Petrolina e região do Rio São Francisco" . Project Details The project has capacity to transport water at a 26.4 cu m/second. The water is diverted from the river through two canals, the Eixo Norte, of 400km and the other, the Eixo Leste, of 220km, and 70% of it would be distributed for irrigation, 26% for urban and industrial use and 4% for rural communities. Two more canals, Eixo Sul and Eixo Oeste, are currently under discussion. According to the EIA, destination of use should be 70% for irrigation, 26% for industrial use and 4% for the population. Due to the project, 34 indigenous communities and 153 Quilombola (Afro-descendants) communities risk to disappear. Communities who have not been consulted prior the start of the mega-infrastructure. The project is to be finalized by the end of 2016 / beginning of 2017 notwithstanding its cost amost doubled to 8.2 billion reais ($3.4 billion). Development of Alternatives To stop the project since it will affect the the territories of living populations and especifically of indigenous and quilombola communities. Environmentalist groups propose to draw water from groundwater reserves. Such alternative would have been much less onerous and would have directly benefited the populations in need of water supply. Why? Explain briefly. Despite the opposition to the project, including hunger strikes in 2005 and 2007 by bishop Luiz Cappio, the project went on and started in 2008, causing social, cultural and environmental impacts. Carta aberta contra o projeto de transposio do Rio So Francisco. Carlito Kiriri. 2005. 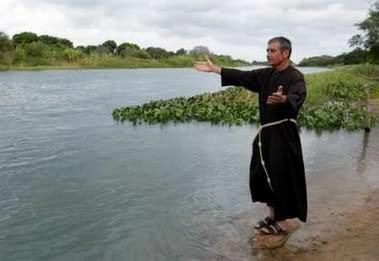 Hunger Strike to Save River: Brazil Bishop Luis Flavio Cappio.